Katie Phillips grew up in Maryland & Colorado and lived in Montana before moving to the Chicago suburbs, where she now enjoys walking her Alaskan Malamute to her job at a local non-profit organization. Katie’s chapbook “Driving Montana, Alone” was published in 2010 and the title poem was later read by Garrison Keillor on NPR’s The Writers’ Almanac. Since then, she has continued to write and travel around the country studying with various poets. She can be reached at DrivingMontanaAlone@gmail.com or through www.facebook.com/katie7phillips. Phillips uses her couplets to create fragments; separate pockets of meaning and image that enhance the poem’s overall sense. Each addresses the title in some way, ranging from common ideas about dementia (“dis-remembering,/ details slipping”) to the idyllic (“away like a room/ full of light”) to the ominous (“were darkening./ Then she broke”) and finally desperate (“looking for/ a way out”). 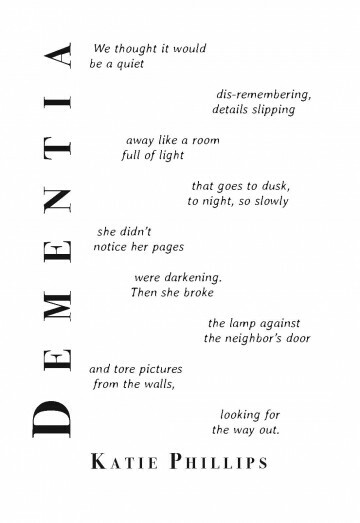 All of these exist simultaneously within “Dementia” the poem and the diagnosis, even as the poem’s sentences trace the overall progression of one woman’s disease. Bodoni’s thick upright strokes feel solid even as the title and poet’s name have been kerned open to make that hold on normalcy a little looser, a little more tenuous than normal. They are holding together, more or less like the speaker, who’s had a rough surprise on top of the difficult realities of losing a loved one to dementia. Averia’s letterforms have the rounded look of something more solid that has begun to dissolve. They feel right for scattered couplets, a poem barely holding its pieces together.